Chandler 4 Corners is launching a dog photo contest on Facebook for the month of April. The dog photo with the most votes, and thus the most popular, will gain fame while the dog owner will win a free hand-hooked pillow from their collection of over 200 designs. We wanted to have a fun contest for our dog-loving friends to share their favorite dog photo and maybe win a pillow, too!" said company president Henry Chandler. 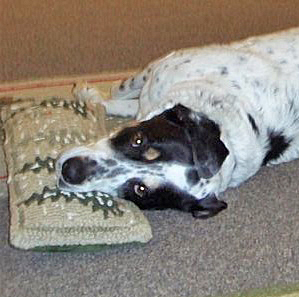 Chandler 4 Corners, producers of premium pillows and purveyors with a penchant for pooches, is holding a contest for dog-lovers across the country. Owners of their beloved dogs are urged to submit the cutest photos of their dogs on the company’s Facebook contest page. Running all through April, the cutest dog photo contest will add a little entertainment while spring comes to life for owners, friends, family and K-9 fans everywhere. The photograph with the most votes by April 30 wins. The winning prize is a choice of any one of the Chandler 4 Corners 18” hand-hooked wool pillows (retail value $79), all of which are designed by Laura Megroz. Many of the nearly 200 decorative pillows in this size feature dogs: dogs in sailboats, dogs in hats, labs romping, golden retrievers fetching, and many more. C4C pillows (as well as their rugs and accent furniture) are coveted for their timeless appeal, sustainable components, and long-lasting qualities. "We're all dog-lovers here at C4C, and a lot of our customers are, too. We wanted to have a fun contest for our dog-loving friends to share their favorite dog photo and maybe win a pillow, too!" said company president Henry Chandler. The contest is open to anyone in the United States over the age of 18, and commences with an upload period from April 1-14, during which time the photos are posted. The actual voting takes place April 15-30, and here is where entrants have free rein to stuff the ballot box! Individuals can vote once a day, every day, so friends and colleagues will certainly be lassoed into voting service to boost that special dog to vicotry. The winner, chosen by public vote, will be notified a day after the voting closes and will receive their gift certificate prize soon thereafter. 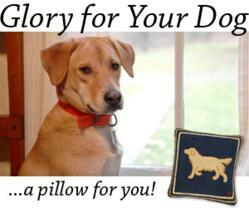 Aspiring winners should visit the Chandler website and begin thinking about which wonderful 18” pillow they want. Chandler 4 Corners has been offering handmade pillows, rugs, and accent furniture to discriminating buyers since 1991. Made of New Zealand wool, the pillows and rugs have striking motifs by noted designer Laura Megroz. In addition, they are incredibly durable, made of sustainable wool, come in glowing colors, and offer wool’s famous ease of care. Visit online at chandler4corners.com or call 1-800-239-5137 to request a catalog. Gracie is one of the dogs of Chandler 4 Corners. She gets to sleep with a C4C pillow under her head!